A conference on the political and social significance of civil marriage will be held Thursday (April 3) in the University of Notre Dame’s McKenna Hall. 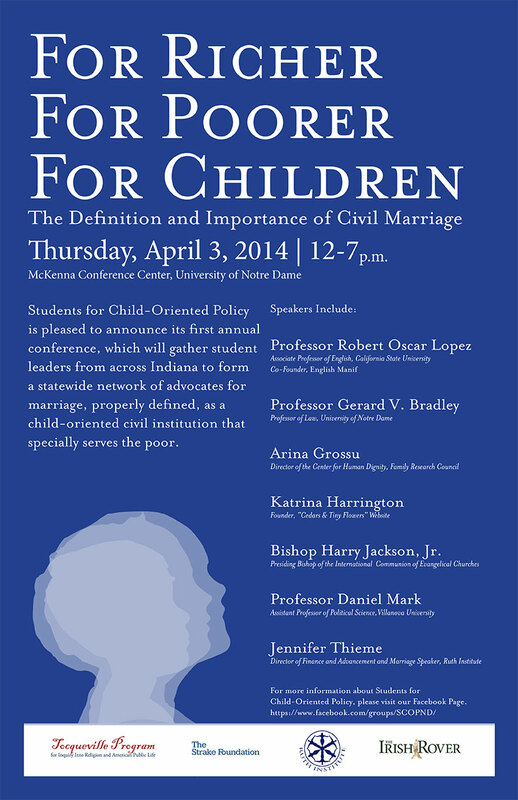 The conference, “For Richer, For Poorer, For Children: The Definition and Importance of Civil Marriage,” is being sponsored by Students for Child-Oriented Policy. Conference speakers will include Bishop Harry Jackson Jr., presiding bishop of the International Communion of Evangelical Churches; Jennifer Thieme, director of finance and advancement at the Ruth Institute; Gerard V. Bradley, professor of law at Notre Dame; Daniel Mark, assistant professor of political science at Villanova University; Arina Grossu, director of the Center for Human Dignity at the Family Research Council; Katrina Harrington, founder and editor of “Cedars and Tiny Flowers”; and Robert Oscar Lopez, associate professor of English at California State University and co-founder of English Manif. Originally published by Michael O. Garvey at news.nd.edu on March 31, 2014.